This is among fans’ questions actress Kathryn Bernardo answered in a Facebook live video on Monday. “Wait! Sagutin ko ‘to kasi dami talagang nag-twi-tweet! Sa’n ba galing ‘yung news na ‘yun? Hindi talaga. Sobrang saya kami ni DJ ngayon,” the star stressed in response to rumors that she and reel-and-real-life partner Daniel Padilla have called it quits or their relationship was allegedly on the rocks, following their announcement that they decided to pursue solo projects this year. “And porket ‘di kami nagpopost na magkasama kami, hindi ibig sabihin hindi kami okay, kasi siguro privacy na namin ‘yung iba, s’yempre,” Kathryn explained. In another post following her FB live video, Kathryn said: "Remember this: The right person will never get tired of you." Kathryn is to star opposite Kapuso actor Alden Richards in a Star Cinema movie this year. While Kathryn forms the love team KathNiel with Daniel, Alden belongs to the rival love team, AlDub, together with Maine Mendoza. 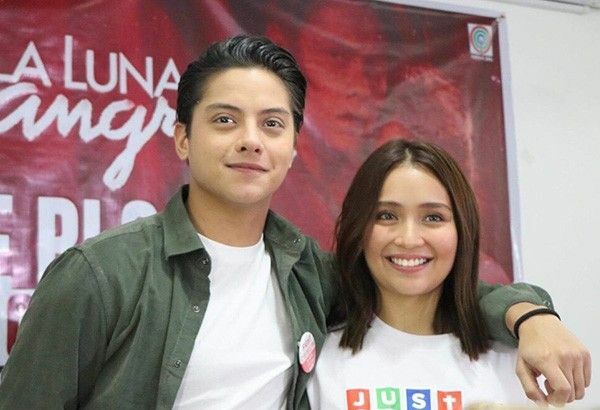 In previous interviews, Kathryn said that though she will be seen less with Daniel, the two of them will continue to love and support each other — off-cam.